The colour image is not a slide but was taken on my mobile phone. I took in it October 2011, when I went to interview the potter Ray Finch, a few months before he died. 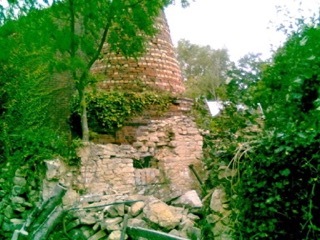 It is the bottle kiln at Winchcombe Pottery, and shows its state as it was at the time of my visit. 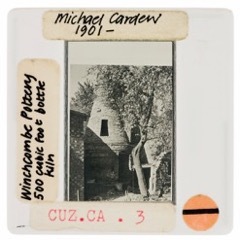 In the slide library at MMU there is an image of this kiln as it used to be, when it was in working order in the 1940s. Such a record provides an example of comparison, of past and present. When the kiln was in its prime, it was looked after and nurtured, worshiped as a god of alchemical power, and fed and watched by men on night duty. In the Second World War it was fired at the time of full moon, so that its flames could not be seen by the enemy planes flying overhead. Now it is a remnant, a ruin in a state of decay, unused and unloved, a shadow of its former self. Such comparisons of then and now are why the slide library is such a useful resource. It is also important to note the quality of slides images which is retained when they are enlarged, and which don’t pixelate or distort. As technology advances our current form of images will soon be out of date and inaccessible. All I need to mention is VHS and vinyl. Some things disappear and deteriorate, others retain their quality and make a come back.